The primary focus of these books (and many of his others) have been on developing the arguments, presenting the evidence, and answering challenges from skeptics for the truth of Christianity. All these books contain pastoral elements that show how nature can be used to discover much about God's character and His purposes for His creation. They all provide Christians with the content to follow Peter's command in 1 Peter 3:15. 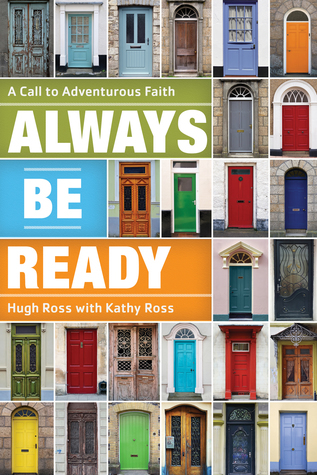 "Always Be Ready: A Call To Adventurous Faith" is Dr. Hugh Ross' latest apologetics book. Usually, Dr. Ross' published work focuses on the scientific evidence for the truth of Christianity, but this time he decided to do something different. In this book, he decided to focus on the apologetic influence of the evidences not only in his own life but in the lives of those he's evangelized. In this book, he takes stories from his decades of scientific research, evangelistic efforts, and pastoral experiences to show to the reader the breadth and depth of what Peter's command to "always be ready" means. Speaking primarily from his heart for those who are lost without Christ, Dr. Ross presents an engaging, encouraging, and essential book for those who wish to follow Peter's command to always be ready. Chapter 1: Ready for What? In the introductory chapter, Dr. Ross describes the phrase "always be ready" as meaning that someone is to take a defensive stance in different situations to protect or guard. He explains that, though, it is often understood in this context, that "always be ready" is often used in a more positive sense of being ready for an opportunity or experience. He explains that the purpose of this book is to focus on, like with his others, the positive side of being prepared to give a reason for the hope that we have in Christ (1 Peter 3:15)- always on the lookout for the opportunity to give the logical reasons for the hope that we have. Dr. Ross explains that in Peter's command, there are three distinct parts: the "why," the "what," and the "how." While his other books (many are reviewed on this blog) have focused on the "what" (the content to be defended), this book will focus more on the "how" and "why" of Peter's command to the Church. The exciting opportunities that we should always be ready for are the situations that God, through His sovereignty, places us in to give the reasons for our hope and positively affect the person's life for eternity. This book is written to be both a guide for the eager Christian case-maker and a personal testimony of the power of God when our hearts are committed to always be ready. Even though this book's focus is on the "how" and "why," a quick review of the "what" should certainly not be missing. Dr. Ross explains that since many people automatically believe that science argues against the truth of Christianity and the Bible, when we present a case for their truth from science, it garners immediate attention and interest. Dr. Ross has found that in his many opportunities to speak with skeptics, four areas of science seem to be the most effective: the beginning of the universe, the fine-tuning of the universe and earth, the origin of life, and the origin and advance of humans. Dr. Ross provides a quick overview of the evidence provided by science for what the Bible claims on each of these topics. He concludes the chapter by explaining how the earth is designed for the effective and efficient presentation of the Gospel to all nations of the earth: an encouraging and exciting reason to always be ready for the opportunities God is preparing for us to present the reasons for our Hope in Christ. For more details on the arguments and evidence presented in this chapter, see the books I linked to in the Introduction. Dr. Ross takes the reader back to the early days of the Church, recorded in the book of Acts to describe was always be ready was like then. In the context of a "great persecution," the Church thrived and grew. This was nothing but miraculous, the result of God exercising His sovereignty in arranging "chance" encounters with the Apostles and key people who could spread the Gospel most effectively. Dr. Ross describes seven unique instances recorded in Acts that he calls "divine orchestrations." He argues that while any one of these events may be explainable as a "chance" event, the fact that they all happened in their respective contexts (including rejected opportunities by the Apostles to avoid persecution and numerous changed plans) argues powerfully for intentionality behind their happenings- that intention being the spread of the Gospel and the growth of the Church. Luke (the author of Acts) gives no indication that these divine orchestrations ceased with the early Church, so Dr. Ross reasons that God continues to prepare such encounters for Christians today. Like the Apostles, we must always be ready, intently searching for opportunities to communicate the reasons for the hope that we have in Christ. Dr. Ross uses his own life to demonstrate that divine orchestrations are common even today. He describes a series of unlikely events, severe challenges, and various circumstances that took place from his preschool years through high school that all seemed to have a singular purpose: His salvation through Jesus Christ. Not only does Dr. Ross testify to God's purposefulness and sovereignty as he presents his story, he emphasizes the immense power of prayer for those who are unsaved and the great influences people can have on others even if exposure is only for a few minutes, which highlights the need for the Christian to always be ready. Dr. Ross continues his story. He takes the reader through his investigation of the various religions of the world, his doubts regarding naturalistic explanations for life's origins, and his discoveries about the amazing congruence of Genesis 1 with what scientists have discovered. He discovered too that Genesis 1 answered the big "enigma" of the history of life. While his previous studies had already convinced him that a God of some kind created and fine-tuned the universe, it was not until he had spent two years testing the scientific, historical, and geographical claims of the Bible that he understood that the God who created and fine-tuned the universe is the God of the Bible. After battling pride and fear and trying to simply act like a Christian (and failing at it miserably), he realized that Christ was calling him to actual salvation and a life of surrender. Once Dr. Ross gave his life to Jesus Christ, his desire to tell those around him was strong but he was unsure how to start the conversations. He discovered that the divine orchestrations in his life did not end at his salvation, rather he became an instrument of divine orchestrations in the salvation of others. Through his willingness to always be ready, God placed him in situations, starting almost immediately following his salvation, to evangelize to others using the knowledge and talents that God had been cultivating in him since he was born. Chapter 6: Readiness and "the Gift"
Among the spiritual gifts listed in Ephesians 4, evangelism is the one that is said, in the rest of scripture, to be given to every believer. Dr. Ross explains that since everyone has different talents, skills, and circumstances (and different combinations of these) that can all be used in evangelism, so every believer will express this gift differently. Further, Ephesians 4 also speaks of its list of spiritual gifts as being used to equip the Church for evangelism. So, evangelism is not only to be practiced to bring others into the Kingdom, it is to be used to strengthen fellow believers. Dr. Ross explains that his initial hesitancy in evangelizing was due to the fact that his being on the autistic spectrum provided communicative challenges (such as the inability to interpret or even recognize non-verbal communication) that are not identified with effective evangelists. However, this challenge caused him to realize the necessity of the work of the Holy Spirit (it is not the Christian who is responsible for changing the heart), and he realized that God could actually use his "handicap" in the unique circumstances (divine orchestrations) that He placed him in. Dr. Ross learned that evangelism is not just a gift as in an ability, but a gift from God that when we engage in it, we are more conformed to the character of Christ. As Dr. Ross began his full-time ministry, he became active in and led many ministries, including a door-to-door ministry, that saw numerous lives changed for Christ. Those who were involved in this ministry saw the power of Christ working and how God prepares the way for those who are ready. Dr. Ross details several specific experiences that seem to only make sense if God was, in fact, guiding the ministry. Several people (including a skeptic of the effectiveness of his approach), who co-labored with him in his ministry, also gave their accounts of various events and testified to the work of the Holy Spirit. Included in these stories, Dr. Ross recounts when it has been clear that the message of the Gospel was accepted in contrast to cultic groups messages, even when the two groups, going door to door, were doing so in the same neighborhood at the same time. He tells a story of an event that, by all naturalistic mechanisms, should not have taken place, and the person who Dr. Ross spoke with had to convince him that it was a direct intervention by God in an answer to prayer. Dr. Ross demonstrates how effective Christ can make His Body in evangelism if we make the commitment to always be ready. God took Dr. Ross and those who joined in his ministry beyond merely working in the local community to traveling nationally and internationally. He describes speaking trips to (at the time) communist Russia. He describes various challenges that arose from issues with everything from locations to translators. He saw how these challenges were turned, by God, into dramatically multiplied opportunities. These unlikely series events led to the acceptance of the Gospel by numerous attendees to the events, including top Russian government officials and scientists. Dr. Ross describes even more miraculous events that took place during trips to Mongolia and China. Throughout these stories, Dr. Ross emphasizes the role of prayer and consciously always being ready. "Always being ready" is not limited to just being ready on the ground but in the air, as well. With how often Dr. Ross travels via air, God works out divine orchestrations there as well. He has had numerous conversations on airplanes about evidence for the truth of Christianity with those who are deeply interested. Rarely are the conversations started by him, though; they are usually started by a fellow passenger making simple conversation about their career or seeing what Dr. Ross is either reading or working on with his laptop and wanting more information. These conversations are with both skeptics who are unaware of the evidence for Christianity and with Christians who are struggling with science/faith issues. Dr. Ross has found that these are to be expected and a quiet flight is rarely the case. Dr. Ross has also discovered the extent to which "always" goes. God orchestrates encounters to build His Kingdom through our circumstances even when we do not feel up to it, whether emotionally or physically. Dr. Ross tells stories of God orchestrating apologetic encounters for him in the oddest of circumstances including an inconvenient stop at a supermarket and when he had bypass surgery. Dr. Ross emphasizes that no matter how inconvenient, uncomfortable, or just plain odd the situation, God is always prepared to use it if we commit to always be ready. Through all the stories provided by Dr. Ross in the previous chapters, it is, no doubt, evident that it is important and effective to follow Peter's command and "always being ready." But being ready is not something that we cannot prepare for alone; it must be done in the community of the Church. In order for the Church to be a place where the Christian's faith can be so vibrant that people will ask about its Source, the Church must not be afraid of doubt and tough questions. It is doubt that drives tough questions that drives the search for answers- answers to questions that skeptics will also ask. Dr. Ross explains that intellectual doubters (and scientists, in particular) are not necessarily opposed to Christianity; they just either haven't been presented with scientific evidence or have not seriously contemplated the existence of God; this is a ripe mission field. He emphasizes the importance of group leaders in the Church to be open to challenging questions from skeptics during the group meetings; this builds trust and opens spiritual doors for those who are seeking Christ. As questions and challenges are raised, sometimes disagreement upon the correct answer will arise among Christians. Dr. Ross emphasizes that part of "always being ready" includes being ready to deal gently and respectfully, being reconciled to one another as we model the Gospel of reconciliation (2 Cor. 5:19-20; John 13:35) to unbelievers. Always being ready not only requires readiness to give answers to questions but readiness to do so gently and respectfully. Many Christians approach giving answers by placing the questioner on the defensive regarding their claims, but instead of this resulting in an openness to alternative views (the Gospel) the intentions behind the approach are misinterpreted and cause a loss of trust which either results in the conversation abruptly concluding or an emotional "shouting" match to ensue. Dr. Ross encourages taking an approach that will encourage the building of trust between the Christian and the skeptic and help keep emotional barriers (caused by our demeanor) to Christ low. He encourages allowing the skeptic to put us on the defensive; encourage them to ask their tough and honest questions, and when we have the opportunity to ask questions, ask ones that are open-ended and designed to draw out the source of their hesitancy to accept Christ. Always being ready involves not only being prepared in our knowledge but also in a winsome presentation of that knowledge. Always being ready results in much joy as God uses us continually to build His kingdom, but there exists an added bonus that Dr. Ross sees in Scripture but is rarely mentioned. This is that we grow in our faith as we share it and present reasons for it. As we obey Christ's command of the Great Commision (Matt 28:19), God brings us closer to Him in our knowledge, character, and relationship (Philemon 6). In actively sharing our faith, we discover that even though we are not perfect at presenting it, the Holy Spirit can still draw people to Him. We also discover that the Holy Spirit does not limit His work in only the person we are answering; often others are listening in and their hearts are being ministered to and being prepared by the Holy Spirit to enter the Kingdom. Dr. Ross explains several other biblical bonuses that come with always being ready, including proper responses to fear, doubt, and ridicule. He explains that always being ready is a life-long pursuit; no matter how much we know about God, He is infinite, so there will always be more to learn, and that increased knowledge further prepares for more of what God has in store for us. In the concluding chapter, Dr. Ross calls the reader to action. He tells of several creative ways others have demonstrated their readiness. He reminds the reader that if they commit to follow Peter's command to always be ready, God will always be ready to use them in any and every situation to build and strengthen the Kingdom. "Always Be Ready" was an exciting, engaging and encouraging read. I can never get enough of hearing how God works through the Body of Christ to build His Kingdom. Dr. Ross' stories not only speak to the power of the Christian always being prepared to give a reason for the hope that we have, but it demonstrates powerfully how God is sovereignly working through those who make the decision to strive for that preparation. It is amazing how God works through the people and the circumstances to bring these Christians in contact with those who hunger for salvation and a personal relationship with their Creator. I not only enjoyed the stories but I garnered much wisdom as to how to cultivate my own preparedness for the use of our Savior. Our God is truly an awesome God with an awesome plan, and it is exciting to see how He works out this plan through the evangelistic efforts of His faithful children. This book serves as a tremendous encouragement to all Christians to wish to see how God uses evidence from His creation to work in the lives of the unbeliever and the believer. The evidence of God's work presented in this book will, no doubt, bring much joy to the Christian's heart and get you excited to be used by your Creator and Savior for an eternal purpose. For every Christian who is passionate about completing the Great Commission (Matthew 28:19), "Always Be Ready: A Call To Adventurous Faith" is for you.